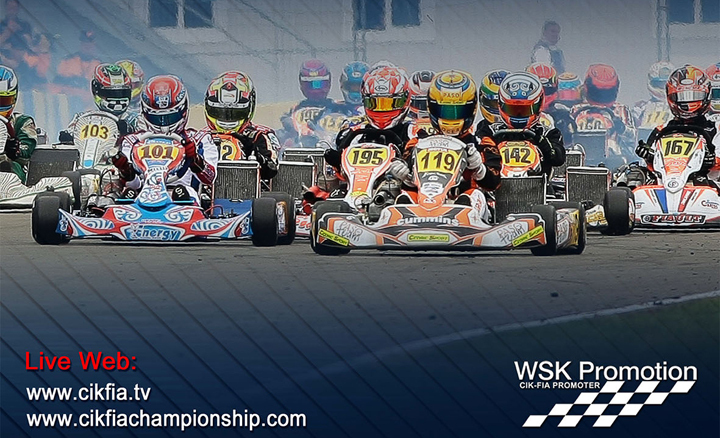 The European CIK-FIA season starts with the KZ and KZ2 categories. They are racing at the French circuit of Essay from 22nd to 24th April together with Academy Trophy. The live streaming on www.cikfia.tv and www.cikfiachampionship.com. The special report will be broadcast by Motors tv. The European CIK-FIA Championship is about to start with the categories KZ and KZ2. In the five 2016 rounds scheduled from April to July, the shifter classes will race three events each. The season-opener is from 21st to 24th April in France, at the Circuit Internationale d’Aunay-les-Bois, on the 1,220 metres long track set near Essay, in Normandy. During the European season the KZ e KZ2 will be in rotation in the 5 events with the other international categories OK and OK Junior and with the CIK-FIA Karting Academy Trophy. As usual, after the European calendar will take place the World Championship and its spectacular closing events of the CIK-FIA season. WSK Promotion, in cooperation with CIK-FIA for the promotion of the World and European Championships, continues its programme of video communication: as usual, we start with the live streaming on cikfia.tv and cikfiachampionship.com, which will have its top moment with the Final Phase on Sunday 24th April, beginning with the drivers’ parade. The following week, the appointment is with the TV channel Motors TV, for a special TV report about the event. The new KZ season starts with a challenge between the two 2016 Champions: Flavio Camponeschi (CRG-Parilla-Vega) and Joel Johansson (Righetti-Ridolfi-TM-Vega), the reigning European Champions of the KZ and KZ2 categories. This time they will both fight against each other in KZ. They will find 27 entrants to deal with and, among them, big names such as Marco Ardigò (Tony Kart-Vortex), Ben Hanley (Croc-TM) and Jeremy Iglesias (Sodi Kart-TM), just to name the top drivers of the 2015 European Championship. Many drivers are racing for new teams, which is going to make the race in Essay even more unpredictable. Among the 58 entrants in KZ2 it is worth mentioning Luca Corberi, Paolo Besancenez and Alexander Schmitz (all on Tony Kart-Vortex-Vega), together with Marijn Kremers (BirelArt-Parilla) and Stan Pex (CRG-Vortex): they were all in the top ten drivers of the 2015 European Championship. Finally, the Academy Trophy confirms the success achieved in its previous editions thanks to the 51 entrants taking part in the race: the drivers – coming from 40 different countries – are all eager to do their best.